Picture Week is coming up at The Pointe – and we are so excited! Read Photography will set up a temporary photo studio in Studio 1, and then dancers will get a quick run-through of their dances in Studio 2. Picture week and studio dress rehearsals May 20 – 24 are in the place of regular classes. Click here for the schedule and click here for order forms (one per class, please). 1 – Plan for the entire ensemble – a dance photo requires the correct costume, tights, dance shoes, and any accessories. Please help your dancer double check that they have everything they need! To double check the tights and shoes required for your classes, click here. Make sure tights are clean, unstained, and have no holes or runs. We should not be able to see any undergarments or extra straps – stop in the dance shop or office for help with the best undergarments for dance costumes ? 2 – Hair & Makeup Matter! Company classes (only Sunday’s pictures) and Dance & Discover classes may wear their hair any way the dancer and family chooses. ALL other classes must have their hair in a recital ready bun (this is great practice)! Recital buns have a part above the dancer’s left eye, all hair slicked back into a low bun (a couple inches above the nape of the neck). Hair should be slicked back and secure in the bun. Dancers should wear some makeup, but do not need to go all out with stage makeup. Please stick to neutral colors. 3 – Parents are welcome to view the pictures being taken in Studio 1 – you may stay to see what’s happening and help your dancer with costume changes, or you’re free to run an errand or two while your dancer is here – up to you! 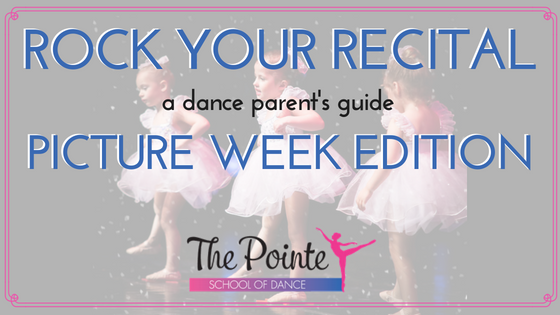 Parents will be invited into Studio 2 during the end of the “studio dress rehearsal” (one or two run-throughs of the recital routine) for announcements and to see the dance in costume! If a dancer has back-to-back classes, they’ll be dismissed a few minutes early from their studio dress rehearsal. 4 – The plan: Arrive a few minutes before your scheduled time, and wait for your class to be called into Studio 1. We’ll take individual photos for any dancer that wishes to order them, and a group photo of the whole class. It is not required to purchase a recital photo, but we do expect dancers to be here for the studio dress rehearsal and in their group photos! Please plan on changing out of your recital costumes for the trip home. Remember, do not eat or drink (besides water) in your costume! As soon as prints are ready (usually 2-3 weeks after recital), we’ll send an email home to let you know! They’ll be available for pickup in our office. We are so excited to bring picture week to the studio (this is our first year having it here – thanks for your patience as we build this new setup!) and see all of your dancers in costume!